On returning to Cold Lake in early October, 1961, it was, as the saying goes, ‘jumping from the frying pan into the fire’. Fresh from basic training, we were now tasked with actually learning the day to day aspects of crash rescue work in real time. The USAF personnel having been temporarily seconded to fire duties at the SAC Site had a full training program set and ready to go when we arrived. First off the mark was learning to use the USAF equipment, none of which was available at Camp Borden. The three main pieces were two giant O11-A foam trucks and a smaller R2 (we call the R-Deuce) rescue truck. There was also one tanker truck (for hauling water/extra foam cans) and several pieces of smaller equipment used on the tarmac for fire protection around the aircraft during engine starts. Photo: Crew from 0-11-A and others tackle fire at a mock crash site. One man remains in the turret while others approach the mock aircraft with handlines. Location of this practice area is unknown. Normal crew size on a 011-A was four – the driver and right hand crewman operated the two electronically controlled roof turrets, while two others operated the lines. The hand line operators could also open a roof hatch and operate the turrets by hand (as in above photo). In approaching a scene, the two hand line men manually operated the turrets while the truck approached and after it had stopped the driver and front fireman would take over with the trigger grips while the hand line operators left the cab to continue to knock down the flames. It was spectacular watching a well coordinated attack knock down a wall of flames with those twin turrets that could lay down tens of thousands of gallons of foam (a mixture of animal rendering and water) within a matter of seconds. There was little that could match the adrenalin rush felt when approaching that wall of fire. In a real life situation, if the aircraft was fully engulfed in flame it was understood the chance of pilot or crew survival would be limited but if there was even the slightest chance of survival, our challenge was to affect a rescue. While we trained for specific positions, all members of our crew were capable of filling every position as needed. Following familiarization with the trucks, we then began work with the US Aircraft on site, primarily the giant KC-97. Capable of carrying 9,000 gallons of JP4 (jet fuel) plus fuel for the giant piston driven engines, the aircraft, when fully loaded, weighed nearly 173,000 pounds. In the event of a crash or ground accident and a fire, a massive explosion could be expected. 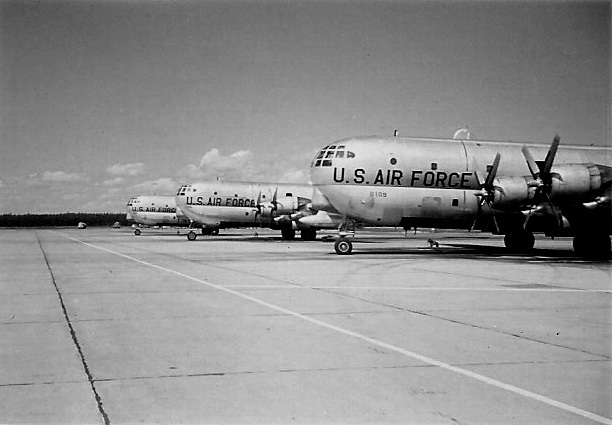 Photo: Three KC-97 Tankers on the line at Cold Lake, looking south from near the threshold of Runway 310. Photo courtesy of Raymond Birn a civilian fireman from the SAC Base. 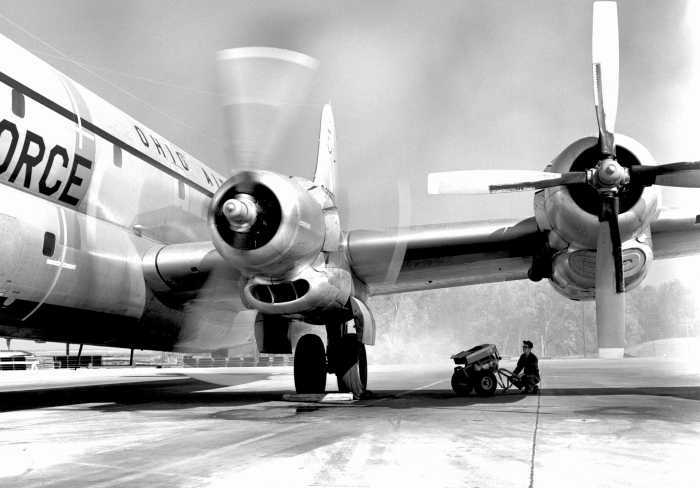 Powerplant: 4 Pratt and Whitney Radial Engines (3,500 hp each). Some models equipped with turbo jets for additional boost. 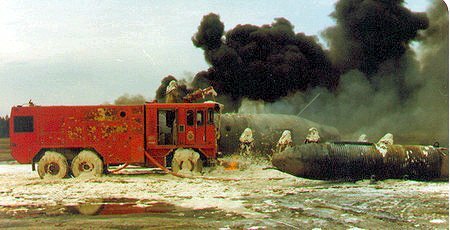 Although no bombers, primarily the B52 Stratofortress, were stationed at Cold Lake, it was necessary to learn the rescue procedures in the event one should make an emergency landing at the base. This was always a possibility as dozens of the aircraft were in constant flight over northern Canada. For these bombers we used schematics to learn the rescue procedures. As Cold Lake was primarily a high performance jet fighter training base for the CF-101 Voodoo and the newly acquired Lockheed/Canadair CF-104 Starfighter, I was now in my glory. Having held a great love of flying and airplanes for many years, I was now able to get up close with some of the newest and best fighter jets in the world. To this point in my life I had only been able to watch from a distance and fantasize what it must be like to become a fighter pilot. Now, at least, I was on the front line1. Crew: There were both single and dual seat models. Length: 54 ft 6 in. 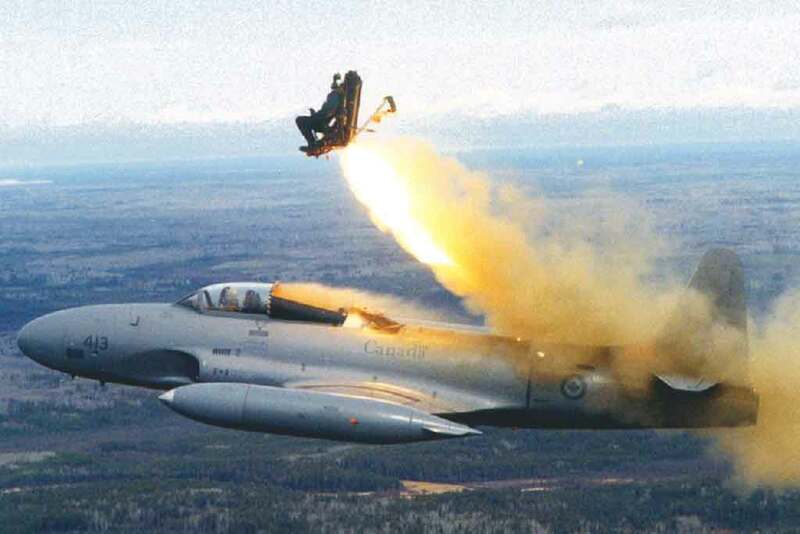 Ejection: Early models had a downward ejection seat but many low level accidents, resulting in a number of deaths, resulted in the aircraft being re-configured with an upward ejection seat. During the course of two weeks we began to learn all that was necessary about working safely around the various aircraft. Of primary interest was ‘making safe’ dangerous equipment such as ejection seats and weapons. The ejection seats were of particular concern as mishandling the removal of a pilot after an accident could easily trigger the seat. This would lead to disastrous consequences for both the pilot and the rescuer. At Cold Lake and other bases there were several accidents involving the ejection seats so the RCAF were sticklers about knowing and following the safety procedures. In addition to the newest jet fighters, Cold Lake was also home to several ‘old timers’ including the last of the lumbering CF-100s, a couple of Sabre Jets (left over from the Korean War) and several T-33s trainers (shown being used to test an ejection seat). The T-33 was very popular and would remain in service for several more decades. As well we became familiar with the numerous piston driven aircraft and helicopters operated by the RCAF and several jet fighters from other nations that participated in periodic training at Cold Lake. After the familiarization period was complete we began to assume more operational responsibility at the base. One of the final steps taken by Senior USAF and RCAF personnel was promoting a Chief and shift Crew Chiefs. Reports from staff at Borden and observations by USAF personnel during our familiarization period played a role in that process. While it seemed likely older recruits with a background in firefighting and management would eventually be the successful applicants, it didn’t stop several of the younger men, including myself, from throwing our hats in the ring. Within two weeks the announcements were made. Ed Valley, who had experience as a Fire Chief with one of the local volunteer fire departments, was named Chief and, as expected, three other men with experience were named as crew chiefs. For my part, I snagged a job as an R Deuce driver and Rescue Specialist. 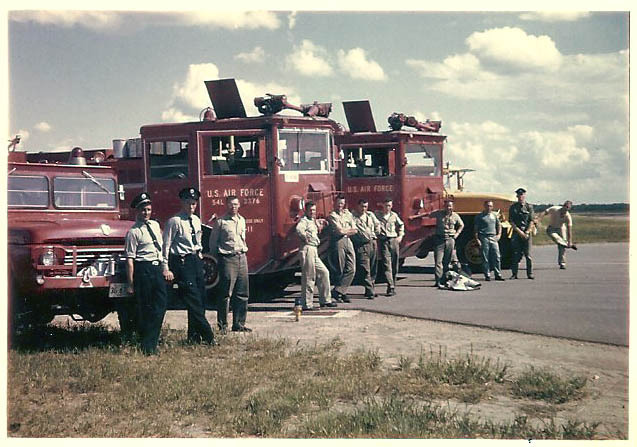 Above Photo: Cold Lake SAC Crew on tarmac with trucks after having taken over operational control at the base: (R to L) Chief Ed Valley, Crew Chief George Grimstead, Firemen Ben Kading, Don Dobranski, Fred Bamber, Raymond Birn (source of photo), Richard Armstrong, Ken Cuthbert (tall man second from far end). Others not named. Over the next two months USAF personnel were reassigned back to bases in the United States as the second group of recruits from Borden joined our ranks and completed their familiarization. We were then divided into three shifts working a 56 hour week (the standard for firemen in those days) in rotations comprised of three 10 hour days, three 14 hour nights, followed by three days off. Given holidays, sickness and other absences we were able to maintain full crew rotations for all trucks. 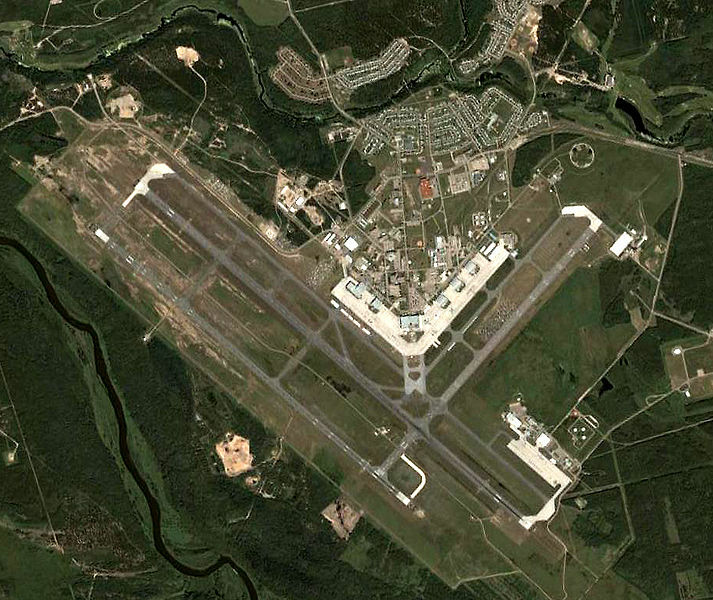 By the end of January, 1962, we had assumed full control with Chief Valley reporting to the USAF SAC Base Commander. 1 Another experience with the CF-104 that I will always cherish presented itself while flying out of the Cold Lake Flying Club. The club was located on the north side of Runway 04/22 near the 22 threshhold. The club was operated by several air force pilots who very much enjoyed instructing on light aircraft. The student pilots became friends with many of those pilots some of whom were active fighter pilots. Photo: Static display of CF-104 trainer used at Cold Lake for ground based flight training. A school chum, Aaron Pinsky, with whom I did a lot a flying in those early years, was close friends with one of the CF-104 pilots. One week-end the pilot took Aaron and me to the training facility where we spent an hour or so flying the CF-104 trainer. It was a delightful experience to be at the controls of that powerful jet even if only in a training mode. How did we fair? Not to bad in straight and level and shallow turns but as soon as we pushed the limits with speed and in manoeuvers, we both crashed the trainer. 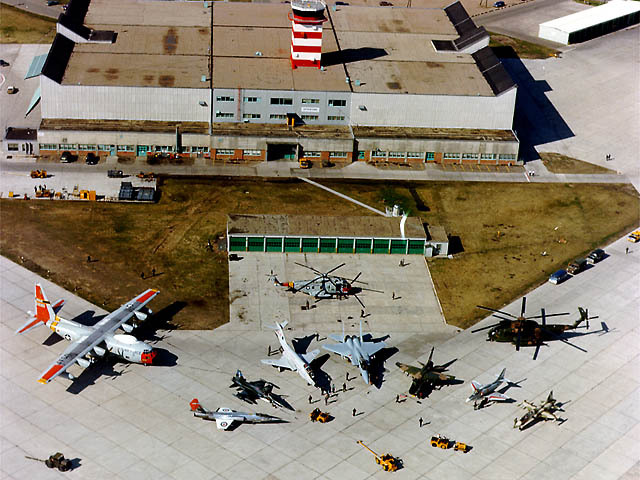 View of Cold Lake Airbase. The SAC base was located at the building site in the lower-right corner of the photograph. This photo shows the second runway (running right to left across bottom) parallel to the main runway 31/13 that was 12,600 feet long. In the early years the Cold Lake Flying Club was located at the top right adjacent to the inside of runway 04/22. Variety of Aircraft on display at Cold Lake outside the main hanger. These aircraft were likely being set out for display at one of the Annual Air Shows hosted at the base every year from its inception. 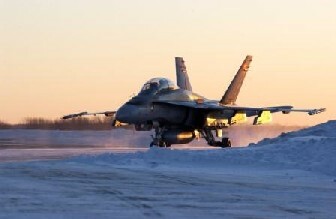 Cold Lake: On a sub-zero morning a CF-101 warms up in preparation for take-off. 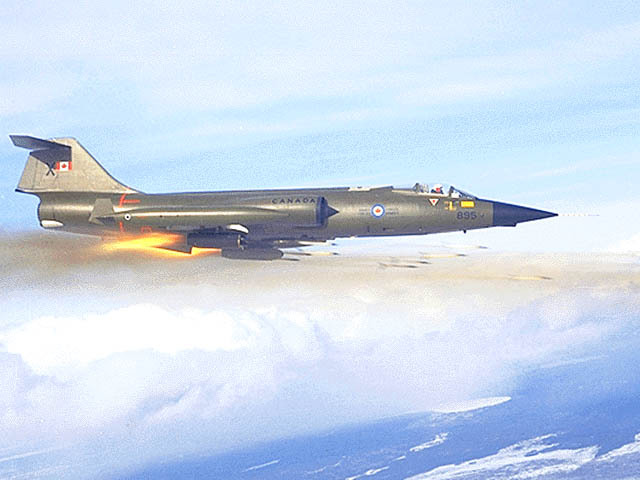 While the CF-101 was in regular use at Cold Lake it was not as well known as the CF-104 perhaps partly because it suffered far fewer accidents. 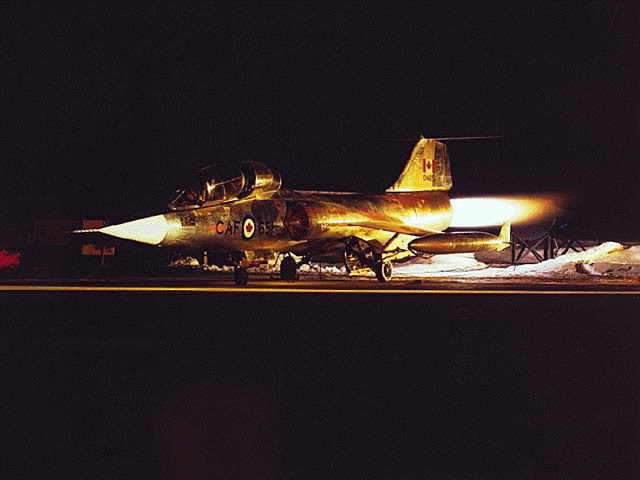 Cold Lake: Night testing of CF-104 engine. The noise emanating from the CF-104 was one of its many endearing features. Some compared it to the sound of a wailing banshee. On a cold winter night the sound could be heard for 15-20 miles around the airbase. 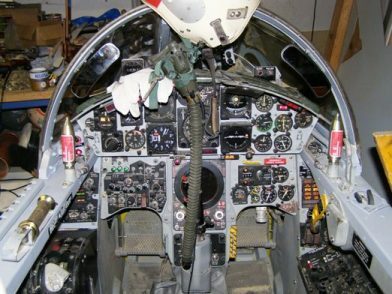 The cockpit of the CF-104 was just a bit more complicated than a Cessna-120 or 172. Fire Watch during KC-97 start-up. At Cold Lake we usually stood by with one of the Fire Trucks, usually an 0-11-A. This is very well done. It brings back many memories of the early days of Ray’s firefighting. I hope you get a good response from other fire fighters.